This Ongoing War: A Blog: 11-Jun-15: Who's willing to confront Orange CEO on terror, now that he is visiting Israel? 11-Jun-15: Who's willing to confront Orange CEO on terror, now that he is visiting Israel? 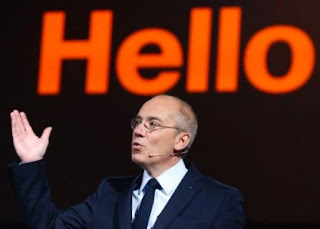 to apologize: I condemn boycotts of any kind, I love Israel"
Stephane Richard, CEO of French telecoms giant Orange, landed at Ben Gurion airport near Tel Aviv Thursday morning. Richard said he would meet with officials and Orange staff during his two-day visit. The orange boss was in Israel to "clarify the misunderstanding" sparked by his remarks during a news conference in Cairo on June 3 in which he said the firm was planning to withdraw its brand from Israel at the earliest possible opportunity. An official in Prime Minister Benjamin Netanyahu's office said the he would meet with Richard on Friday... Richard for his part insisted there was no political motivation, and that the decision was solely driven by Orange's brand strategy. According to Orange, Israel is the only country in the world where it has a trademark agreement with a company that is not a subsidiary. Over the weekend Richard told AFP that he "sincerely regrets" the comments, and was invited by the Israeli government to visit the Jewish state, saying he would be "a welcome visitor".... Partner, Israel's second largest mobile operator, had insisted the Orange chief travel to the country to explain himself, an invitation he quickly accepted. We think the management team at Partner, Orange's Israeli licensee, ought to ask Richard to respond to the letter we sent him and about a dozen of his Orange management and media relations colleagues in January. They concern Orange Jordan and Orange France's backing for a school in Jordan that has declared the Islamist terrorist murderer of our daughter as its "success model". More than one third of the foreign governments, NGOs and corporates who had been providing that Jordanian school with backing and funding withdrew their source when we wrote to them and pointed out the scandal. Orange ignored all our letters.